On tour in the "dark heart of Asia"
At the moment I am enjoying some time in Kota Kinabalu on Borneo Island, a place I've visited many times over the years. Nestling in the foothills of Mount Kinabalu, South-East Asia's highest mountain, it is a fascinating place referred to locally as the "land beneath the wind". When I was a kid the word Borneo conjured up Tarzan-like images of explorers hacking their way through impenetrable jungles full of man-eating plants, wild animals and roaming tribes of headhunters. Last week a group of students from our school returned to the UK after a couple of weeks training and experiencing this "dark heart of Asia". For the group the experience was quite different from the Chenjiagou boot camps they have taken part in. Here each morning began with Taijiquan practice on the beach looking out to the South China Sea. If there is a more idyllic place to train I've yet to find it. The rest of the time was spent getting to know this part of Borneo Malaysia. Chinese make up the largest ethnic group of Sabah, followed by the 30 or so indigenous native tribes. 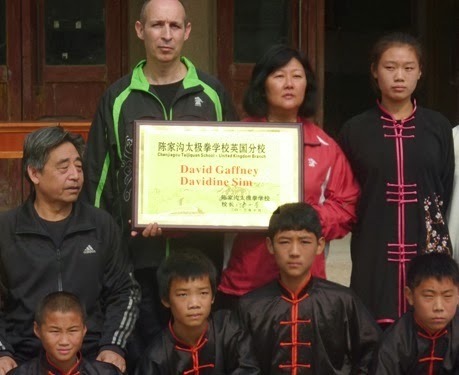 It's not possible to really understand Taijiquan without first understanding Chinese culture. Taijiquan was not created in a vacuum, but drew on many aspects of traditional Chinese culture: martial arts, the ancient health giving methods or daoyin tu-na, yin-yang philosophy from the Yijing and jingluo theory from Chinese medicine. The names of many movements within the forms are drawn from Daoist and Buddhist roots, whilst the "Chen Family Rules" are a typically Confucian call to correct and upright behaviour. the devastating effects of communism and the cultural revolution on these ideas in mainland China. Many of the Chinese diaspora spread around the world are in fact far more representative of these ideas than China itself. One afternoon our group visited a local Chinese temple - the Tian Wang Miao or Heavenly King Temple. It is a working temple - there are no entrance fees, souvenir shops etc. Several members of our party commented on the difference in behaviour of visitors to the temple - quietly reflecting and praying rather than having a day out at a theme park - to the temples they had visited in China. Another visit was to the Mari Mari Cultural Village where we got up close to some of the local tribes of Borneo. 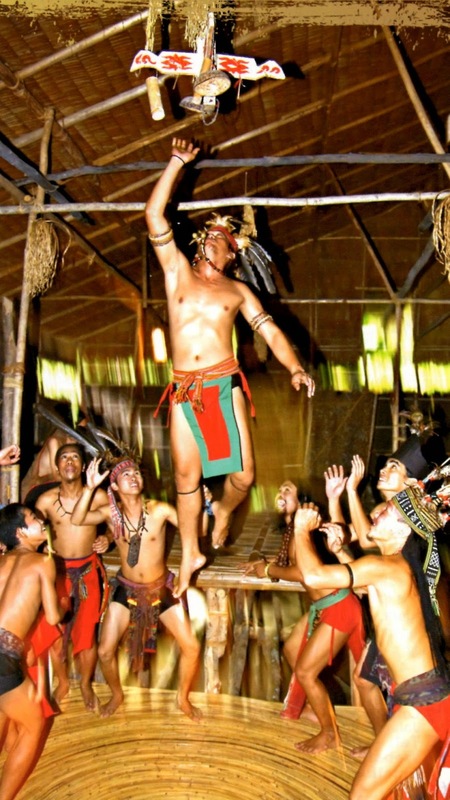 Most interesting - from a martial arts perspective - were the Murut tribe. The Murut were the last tribe in Borneo to give up the practice of headhunting. They had lots of ingenious methods for training fighting skills including a bamboo stick dance where, much like a western boxer, they would train footwork and co-ordination. The dance is called the Magunatip Dance - "atip" meaning to be "caught between two sticks". Six to eight pairs of bamboos are rhythmically clapped together, their speed controlled by the beat of the accompanying music. Starting slowly, the dance gradually increases in speed to an adrenalin pumping frenzy. In the past this dance was used to prepare for battles. Warriors who failed the test of speed and agility and were caught in the bamboo were deemed unfit for battle. I used to do a similar, though less intricate exercise when I trained Shaolin Gongfu back in the early nineties. At the time I thought it was a traditional Shaolin exercise, but considering that the head of the system was a Malaysian Chinese teacher, I can't help but wonder at its origin. Another ingenious training aid is the "lansaran", a wooden platform set on bamboo springs and set in the middle of their longhouse. Using as much might and power as possible individuals leap high into the air in an attempt to reach a target that has been secured there. Sometimes the young students in the Chenjiagou Taijiquan School practice a similar, if not so dramatic drill using a mat placed against the wall as a springboard and trying to leap up and touch the ceiling. Malaysia has a strong martial arts heritage with its own indiginous arts as well as a strong Taijiquan presence. One evening we even found ourselves eating in the Kung Fu Bak Kut Teh restaurant. 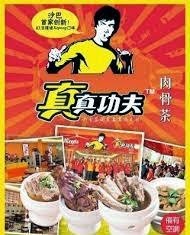 The shop front, menus and even the waitresses uniforms were decorated with brightly coloured images of Bruce Lee. Bak Kut Teh literally translates as "meat bone tea" and is a mix of pork ribs cooked in a dark soup rich with medicinal herbs. How long till we see the Kung Fu chain coming to the west? After seeing the group off at the airport I moved to KK's Luyang district to stay with my in-laws Mike and Alice. Every time I come to KK I take the chance to train in the nearby Tun Fuad Stephens Park, or Bukit Padang as it is known locally. Bukit (meaning hill) Padang is a popular exercise site where from as early as 4am locals come to jog, practise Taijiquan and Qigong or simply to take the air and meet up with friends. A steep trail leads to the top of the hill made up of a gruelling set of 300 or so steps leading to a small clearing and then another couple of hundred steps leading to a flat summit with various stretching and exercise apparatus. Many KK locals use this hill to train for the gruelling climb up the overlooking Mt Kinabalu, especially the elite athletes who take part in the annual Kinabalu Climbathon billed as the "world's toughest mountain race". Each morning we begin doing reps up and down these steps while it is still cool and dark, finally coming out onto the summit clearing to do some Taijiquan and stretching. It's interesting to see the difference in how people in the west and east approach exercise. The same group meets at the summit every morning - some are super fit who race up and some are older people who stroll up leisurely. Each morning there are laughter and banter between the group as they went through their routines. The World Health Organisation defines true health in terms of three important aspects "complete physical, mental and social well being". How many times are the mental and social aspects overlooked in the appearance-obsessed gym culture of the west? Another striking difference is the amount of stretching and arm swinging loosening exercises. This philosophy is adopted not just by young gymnastic exercises, but by people of all ages. There is a saying in a Chinese exercise circles that if you "Stretch the tendons by one inch, you can add ten years to your life". "Stretch the tendons by one inch, add ten years to your life"
Throughout South-East Asia traditional medical systems are widely practised, ranging from dubious folk remedies to well respected healing systems such as traditional Chinese medicine. Taijiquan theory draws upon many of the ideas handed down in TCM. While it is not necessary to be an expert in TCM, to do Taijiquan well it's interesting to experience the application of these theories in their original context. Over the course of the last week I visited local Chinese physician Dr Yek several times to treat a shoulder injury that had been giving me trouble. The waiting room is different than those of most Western doctors. There are no marketing leaflets...no men in white coats. In one corner of the room a battered punch bag, a set of dumbbells and a barbell are strewn around the room and also a play station sitting on a table! Some interesting shades after a few treatments! methods like acupuncture, tuina, moxibustion etc, he is carrying on a traditional treatment method which involves striking the patient's body to clear blockages of energy. Yek learned from his father from an early age who in turn learnt from his father... This form of healing has a close association with Chinese Martial Arts and Yek's father is well known in these parts as an accomplished traditional healer who also happened to be a disciple of the famous Taijiquan and White Crane master Huang Xingxian. His uncle teaches martial arts in New Zealand. According to Dr Yek, this form of treatment is rare even in China. Where there are many universities and hospitals teaching acupuncture and massage the system of hitting the body to promote healing is only passed down from master to student. After a short examination he began the treatment. Dr Yek strikes with the back of his hand and fingers in a fluid, elastic and surprising strong motion. 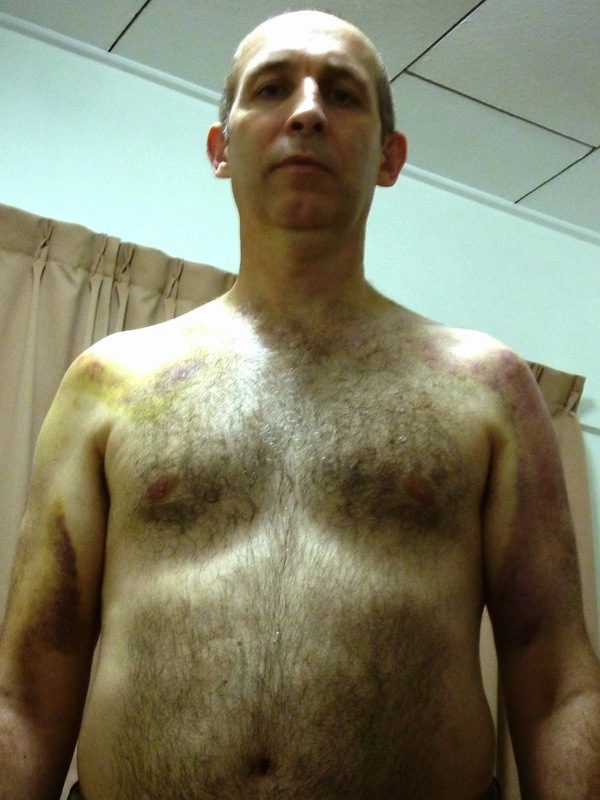 This treatment is not for the faint-hearted and after a few visits my upper body was black and blue and a number of other interesting shades. He explained that to hit correctly one must "fang song", have a strong root and be able to bring strength up from the feet. Sounds familiar doesn't it?